For those Beer Snobs who want a true unbiased palette’s opinion on beers around the world. You need to look no further! I rate my beers from a scale to 0 through 5 on several different categories (like head retention, aroma, flavor, appearance, and overall experience). 0 being the worst, and 5 being the best. Each Month I will present the Beer Review of the Month! Recently, a good friend of mine (Sara) gave me a sampler pack full of Mexican beers at my last tasting party. Being part “Messican”, I thought this would be a great opportunity to write up some beer reviews on some hard to come by Mexican beers. In case you’re wondering if Corona was somewhere in the sampler pack, I’m gonna have to break your heart and say “No”…lol. This Mexican beer or “cerveza” has a unique history behind it. I’m not going to bother with the details at this time, but if you’re ever interested, the story is here. Fortunately, I was at home this time around to sample this beer to give it a proper beer review unlike the Lasko experience. As I cracked open the twist-top cap off the bottle, a nice “psssssssst! !” followed by a small Mexican Co2 cloud puff fell down the neck of the bottle. I poured the brilliant amber-hued brew into the pint and noticed that I lacking some head from this bottle. The head was 3/4 finger width at best, and was slightly off-white in color. The head lasted only 3/4 quarters of the way down the pint and didn’t leave any lace behind on the glass either. From the nose, there’s an evident hoppiness/maltiness to the brew, the hoppiness is very floral with a hint of citrus to it. The maltiness must be from the crystal malts used in the brew. On the palate, there’s a lot going on..at first the floral/citrusy hoppiness is present, carbonated nicely, but then the sweetness of the beer chimes in right away towards the finish. The hoppiness enjoyable and is not cloying. Unfortunately, it was the slightly warm-sweet finish that I did not really enjoy. It also has a medium-full body, which can be explained by either a high mash temp or a lot of crystal malts the brewery uses. 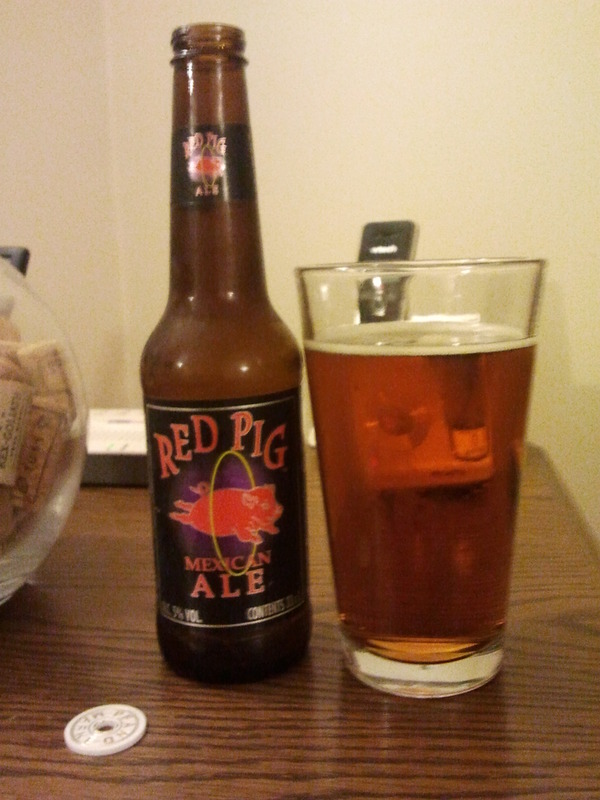 Overall it’s a good beer, this would be the beer that I would drink while I’m already buzzed at a BBQ. Since this beer was free, I don’t have a clue to what this beer costs. Overall I give this beer a 3 out of 5.